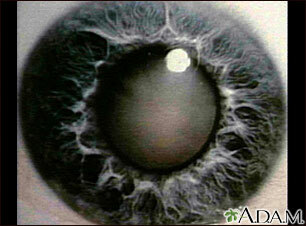 This photograph shows a cloudy white lens (cataract) as seen through the pupil. Cataracts are a leading cause of decreased vision in older adults, but children may have congenital cataracts. With surgery, the cataract can be removed, a new lens implanted, and the person can usually return home the same day. Updated by: Franklin W. Lusby, MD, ophthalmologist, Lusby Vision Institute, La Jolla, CA. Also reviewed by David Zieve, MD, MHA, Medical Director, Brenda Conaway, Editorial Director, and the A.D.A.M. Editorial team.